SKU: 0732. Categories: Endurance Saddle Pads, Western Saddle Pads, Western Correction saddle pad, Western Work Saddle Pads, Western Horse Tack, Therapeutic Saddle Fitting Pads. Tags: endurance saddle pad, Western Saddle Pad with shims. This pad is 29″ long and has a 17″ drop on either side making it 34″. A Panel of 3/16” (4.8mm) thick ThinLine performance foam is sewn on each side of the spine. Wool felt fill, topped with a waxed cotton based fabric that sheds water. 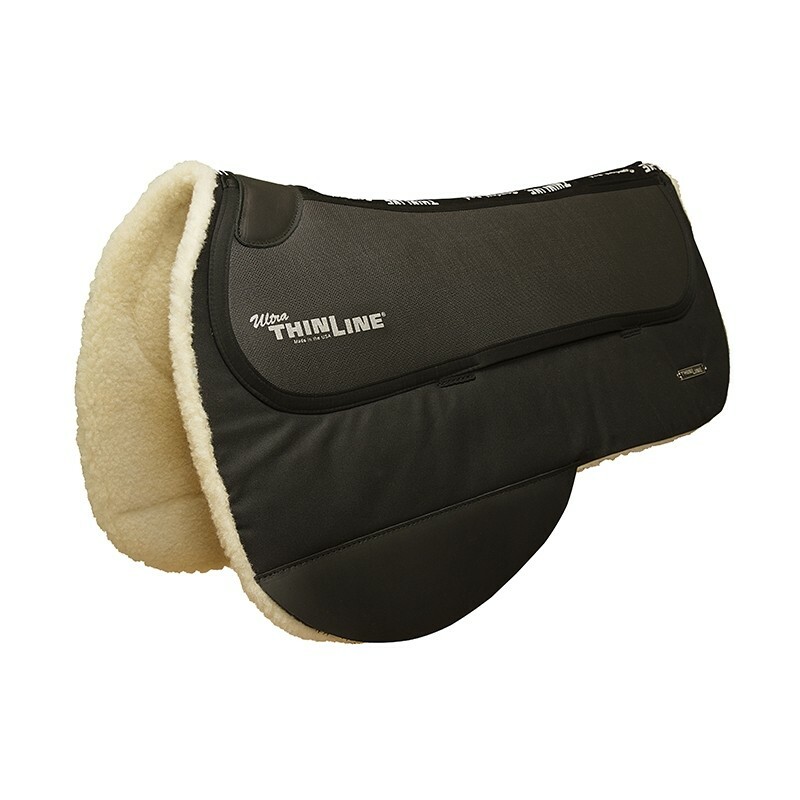 4.5 inch wither profile allows this Western therapeutic saddle pad to fit both high withered and mutton withered horses. Contoured top line allowing the pad to accommodate the natural curve of the horses back. The open pocket design allows you to add ThinLine shims – giving you not only perfect saddle fit but extra protection right where you need it. Underneath the ThinLine layer is a pocket to insert Western saddle shims. 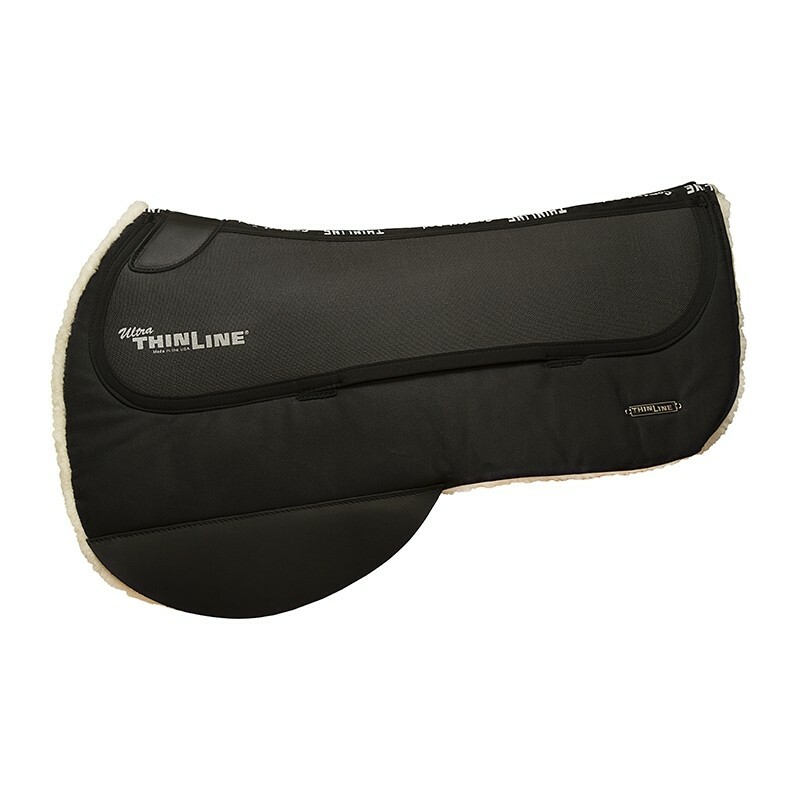 If you need help with minor saddle fit adjustments, purchase this Western therapeutic saddle pad and use it alone or add shims. Either way, your saddle will fit better and your horse will use his back better and stay sounder longer. Shims are made of the same amazing ThinLine material. Once you place this pad in your shopping cart, you will see below your cart: Add shims to the pad in my cart. Simply add the shims you need. After receiving your pad, ride in it for at least a week. At first, you may simply notice things like; “my horse was great today, my seat and aids were soft and effective”, great job! You are on your way. You will see a daily improvement but this can be a bit subtle in the beginning. How to check out your pads effectiveness: After at least a week of riding daily, begin your warm-up with the ThinLine. Once you are warmed up, remove the ThinLine and ride. This is when you will see just how much your horse is loving his/her pad. We are riders making products for riders and understand how important the time we have with our horses is. We want every ride to be the best ride. If you feel ThinLine is not delivering what you need, all products may be returned for a full refund within 30 days. Around the world, this product has helped both riders and horses work happier together. We hope our 30-day satisfaction guarantee will help you have the confidence to try this amazing material! Day to day maintenance- Remove dust and dirt from waxed top with a soft brush. Remove hair and dirt from lambswool with a stiff brush. Deep clean- hand wash with mild soap and hang to dry. Reapply wax ointment as needed to maintain water repellent finish. Q How long is the drop on the rear? Is it 12” like the ranch pad? A Thank you for your question! Yes, the rear drop on this pad is 12", just like the Contour Western Ranch pad. A Thank you for your question! The Tough Rider Waxed pad is 3/4" thick and constructed with waxed cotton top layer, light wool fill, and a high quality sheared lambswool on a fabric backing underlayer. It is available in one size and is fairly easy to care for. The Full Sheepskin pads are about 1" thick and constructed of quilted cotton on top, light fill, and medical grade Merino sheepskin on a natural leather hide. This pad requires the additional maintenance typical of sheepskin on a natural hide. Care instructions are available on each product page. Please call us at 888-401-9101 if you have further questions! A Thank you for your question! 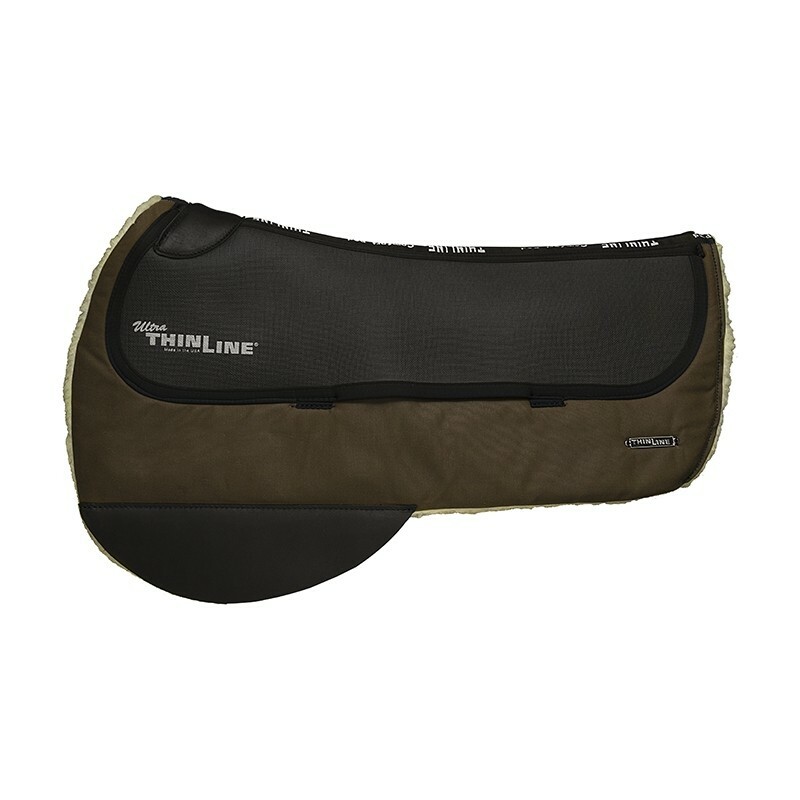 All of ThinLine's shimmable pads are fantastic for young, developing horses. The shimming system allows you to adjust your saddle fit as she grows. As for the specific pad, we recommend selecting a pad that is a good fit with your particular saddle style made out of the base material that you prefer. If you click on the Australian flag at the top of the website, you will be taken through to the ThinLine Australia page for ordering. Q How thick is the pad in total? Would it effect a correctly fitting english saddle? Q Is it 28" from front to back and 32 from spine to flap? A Thank you for your question! Yes, this pad measures 28" along the spine, front to back, and 32" across the shoulder from bottom of left flap to bottom of right flap.